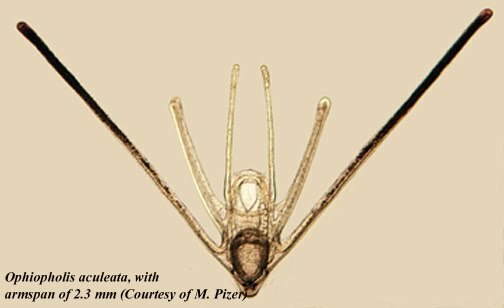 The Echinoblog: "The Most Common brittle star in the world"?? The tropical-global invasion of Ophiactis savignyi!! "The Most Common brittle star in the world"?? 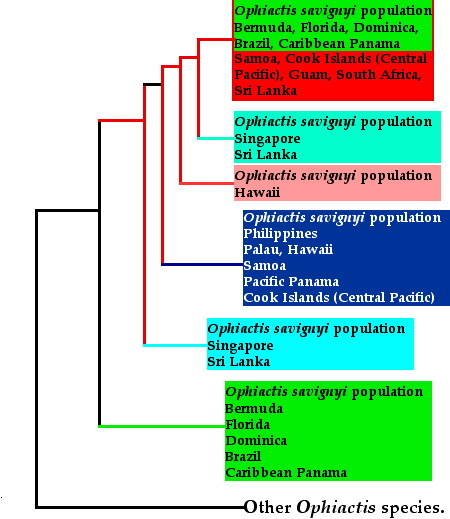 The tropical-global invasion of Ophiactis savignyi!! Of ALL the living echinoderms (starfish, sea urchins, sea cucumbers, crinoids, etc. ), there's one group that has has become numerically dominant, successfully infiltrated MORE nooks, crannies, and little niches than ANY OTHER echinoderm, and probably has MORE species then any other of the living echinoderms.. Some species of brittle stars have a nearly WORLDWIDE distribution. One case in point-one species that famous/infamous echinoderm taxonomist Hubert Lyman Clark called "the most common brittlestar in the world": Ophiactis savignyi!! Ophiactis savignyi was described back in 1842 and literally occurs in the tropics ALL over the world in the tropical Pacific, Atlantic and Indian Oceans. This includes Hawaii, Egypt, Australia, Africa, Asia and so on. Its a very tiny species and isn't much better then the tip of a pen! 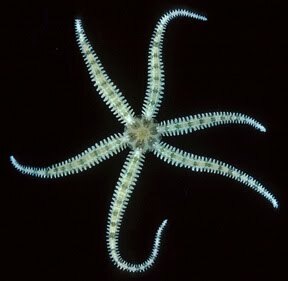 Its unusual for a brittle star in that it has 6 rays instead of 5. 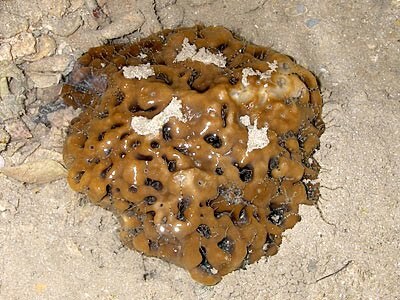 Its a species that is frequently encountered in the coral rubble in tropical aquaria. The authors collected samples of this species from throughout the tropics!! They then sampled DNA (specifically the COI mitochondrial DNA gene) from each of the sampled specimens indicated above. The gene chosen is most useful for distinguishing differences (i.e., the divergence) among populations. 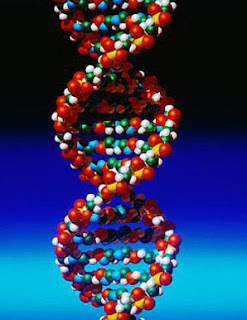 So, the DNA is used as kind of a "signature" for determining WHERE the specimen (within this single species) came from.. They can then analyze and compare the DNA in order to group or cluster where the "signatures" originated! Bear in mind, that for the most part, the external differences in this widely distributed species are likely very minute if present at all.. So DNA is usually the only way to determine where these specimens came from.. So, what does this tell you? The entire remaining tree in red and blue is essentially Indo-Pacific, that is from areas throughout the Indian and Pacific Oceans-Hawaii, South Africa, Sri Lanka (off India), the Philippines, Guam and so on.. BUT WAIT. Is that GREEN I see, lodged up there amongst the RED? There are ATLANTIC specimens that cluster closely with the PACIFIC ones! In other words, individuals collected from the Atlantic, show essentially NO (or very little) genetic differences with Indo-Pacific specimens. 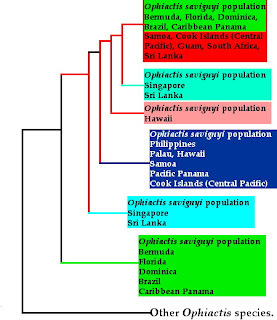 This implies that at some point a population of Atlantic Ophiactis savignyi migrated from the Indo-Pacific region.. They were also able to assess that there was essentially no genetic change over 3 million years! So, what explains the presence of Atlantic haplotypes among the Indo-Pacific ones??? This suggests that there has been RECENT genetic mixing and long-distance dispersal of these different populations!! How could Atlantic members be dispersed to the Indo-Pacific? Could ocean currents be the mechanism responsible for the pattern? In most cases, long distance distribution of species, such as this, is usually due to ocean currents moving larvae away from their "home" or natal sites. Various current hypotheses were considered. Migration around the tip of Africa (Cape of Good Hope) was rejected because of the cold Benguela current, which would have likely killed the tropical larvae right away. 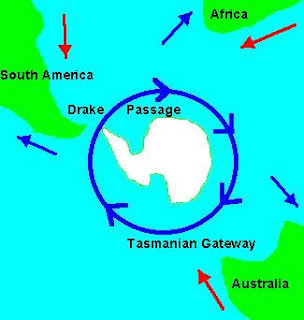 And the cold Antarctic Counter Current was thought of being similarly too cold to permit the tropical larvae to pass around the tip of Cape Horn to reach the Indo-Pacific!! They further reject either of these "migration paths" because they also don't see parallel patterns in other marine invertebrates with similar distributions. So what does that leave?? If all of the "conventional" means of dispersal are eliminated? What's left?? Was Ophiactis savignyi artificially introduced to the Indo-Pacific??? 3. Ophiactis is VERY widely distributed. These all suggest colonization/invasion, followed by a rapid and widespread distribution of a species! But how? The difference among populations is SO recent, they suspect that this is likely the result of HUMAN-mediated transport. The authors consider that just a SINGLE sponge can contain up to 3000 individuals! Just a SINGLE sponge containing larvae and/or a few adults could have "colonized" the Western Atlantic!! Both of the Atlantic populations could conceivably have been seeded from Indo-Pacific ancestry as recently as the early 19th Century! They speculate that the ENTIRE presence of this species in the Atlantic could be artificial!! The authors add further caution to the paper's conclusions that with the ready transportation from ballast water, larvae from outside regions are readily transported to foreign waters, resulting in unforseen ecological impacts. I would further add that I have often frequently observed this species in the rubble of aquarium tanks. Its a species you see in many tanks with tropical inhabitants-both Atlantic and Pacific. Ophiactis is small and comes in with the "living rock" and gravel pretty easily.. Here, we discover what was thought to be a natural, widely distributed species-turns out to be the likely possible result of a human-influenced "marine invasion" from a foreign species. 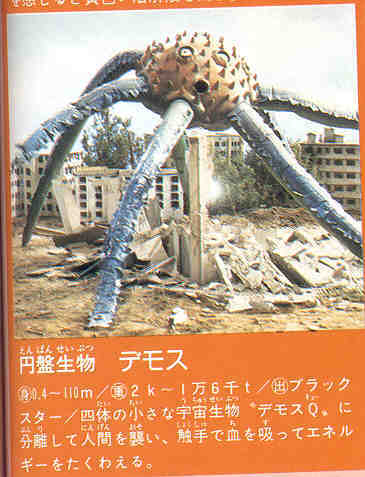 Sort of the echinoderm version of the rat or the cockroach. Ophiuroids GET everywhere. Who knows how successful and out of hand they'll get?? Pycnopodia Juvenile Stage Has Arrived! !